View from the Marriott Terrace of Condado's beaches. 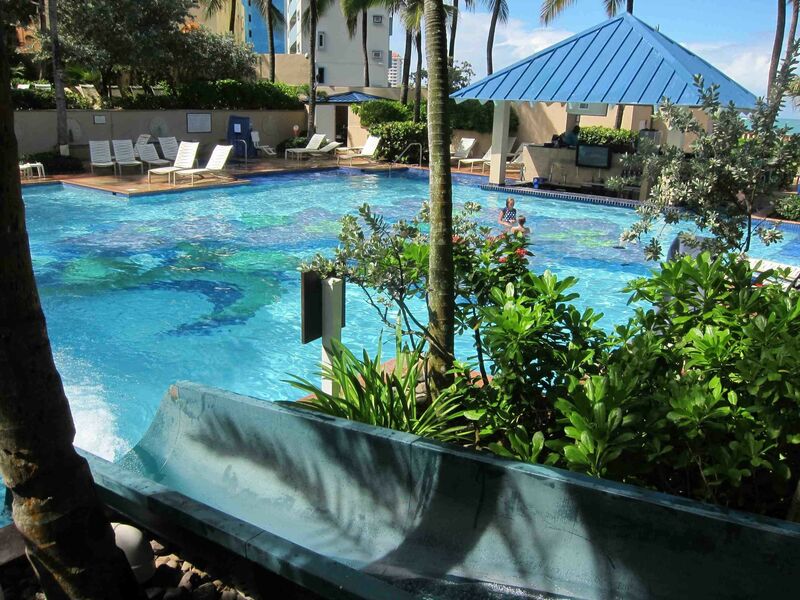 Marriott Pool and Slide at the San Juan resort. Marriott's Beach is fun for families, and the service is non-stop. 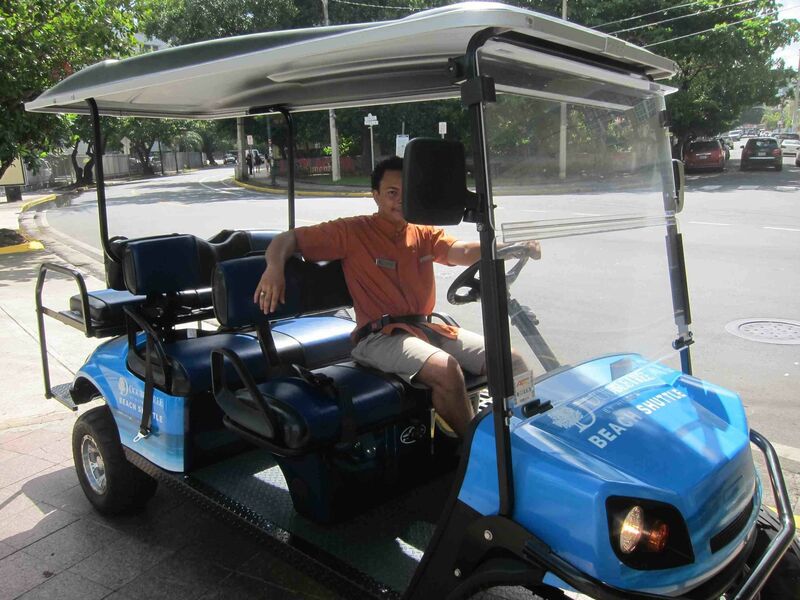 The Doubletree Beach Shuttle is a fun golf cart adventure. Doubletree Pool Area at the San Juan resort in Condado. 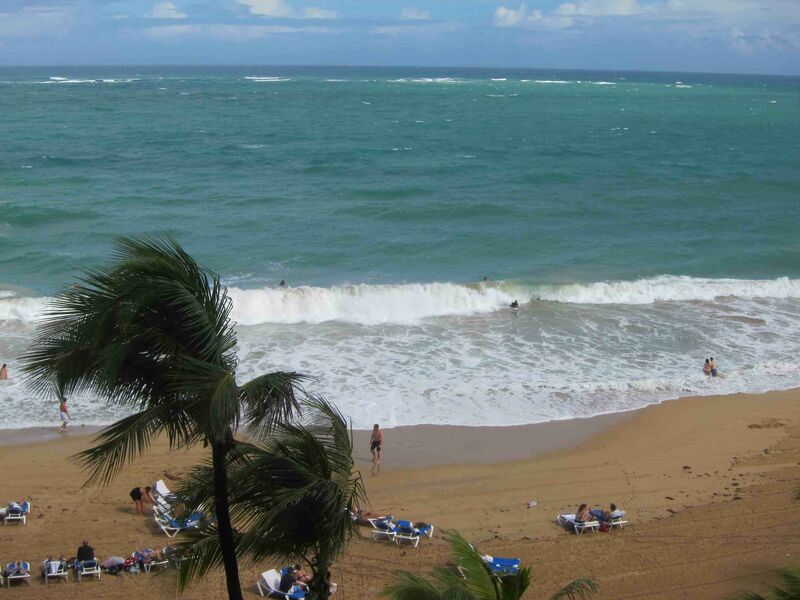 Hilton Condado Plaza Beach has calmer, quieter surf, perfect for non-swimmers. 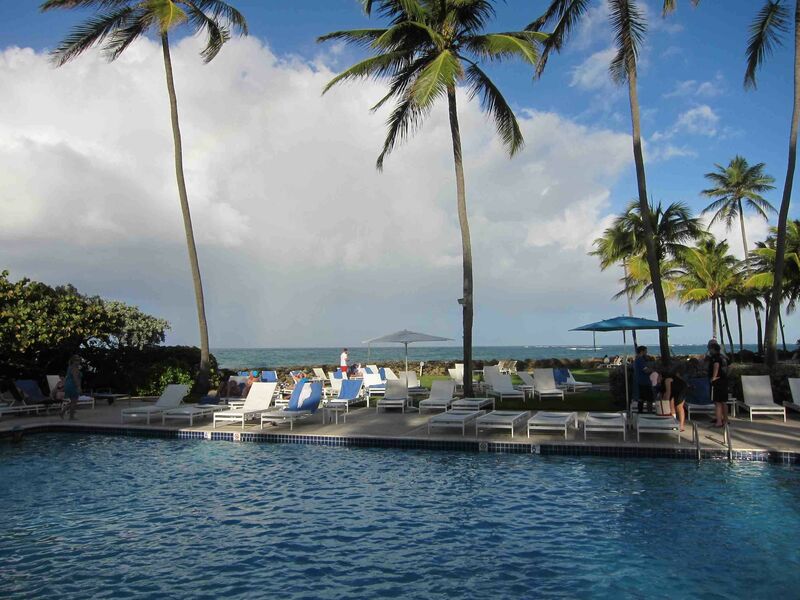 Hilton Condado Plaza Pool is fun for all ages. Puerto Rico, an easy Caribbean getaway loaded with family appeal, should be on the list for your next tropical vacation. American citizens need no passport to enter this U.S. territory, yet a visit to this island nation feels foreign enough to be exciting. Just over a bridge from the more expensive capital city of Old San Juan sits an invigorated beachfront community, Condado. Besides the terrific beach, trendy shopping and dining options are clustered along this community’s swanky Avenida Ashford. There are scores of resorts that cater to families who fall for Condado’s beachy charm coupled with cosmopolitan pleasures. On a recent visit, I sampled three diverse ones to consider for your next family beach vacation. If you’re looking for a soup-to-nuts beachfront resort with an eye towards families, make your reservations. The towering San Juan Marriott Resort & Stellaris Casino is located on a particularly gorgeous swath of Condado Beach. You can hear the sound of crashing waves from your room and see the palm trees swaying in the Caribbean breeze from your balcony. Wave-seekers love this slice of beach, so expect to see plenty of surfers. You can rent a boogie board but careful, the undertow here can be strong. The large pool complex is a winner, complete with a waterslide and swim-up bar. There are plenty of activities in the pool area to keep everyone occupied. Morning yoga, a scavenger hunt and afternoon cookies are just a few of the complimentary daily happenings. The 525 airy guest rooms don’t skimp on the luxuries. There is a casino on site, but it is tucked away on one side of the lobby, so we didn’t notice it even existed until we actually looked for it. The fact that the casino (and the entire property) is smoke-free really helps to keep its presence discreet. The Marriott heats up at night. Top-notch live bands attract an energetic local dance crowd. Swing to a salsa and merengue beat and you’ll feel like an authentic Borinqueño(island-speak for a local). The service at the San Juan Marriott stands out. Beach and pool towels were always plentiful, the fruit flavored water dispenser was always full and the front desk clerk did her best to allow us to check-in several hours early. The gym is well equipped and there was a selection of hot and cold beverages available at no charge, plus a bowl of fresh fruit, perfect to hydrate post-workout. There are excellent dining options on-site, including an eye-opening breakfast buffet served at the Latin Vista Grill. Made-to-order omelets, chocolate-chip waffles and tropical fruits in a rainbow of colors were just a few of the a.m. offerings. If you want to explore Condado’s dining scene, exit the resort and you will be in its epicenter, Avenida Ashford. This hotel is a find for adventurous families seeking reasonably priced digs. 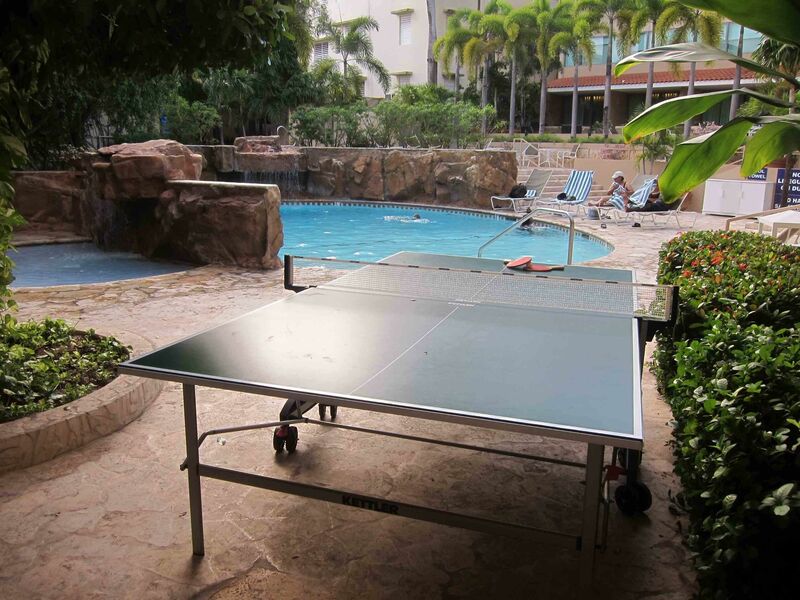 If you are interested in sun mixed with a dash of local culture, the Doubletree by Hilton San Juan hits a home run. Note that this property is not located on the beach, rather three blocks from one of Condado’s finest stretches of sand and surf, as you can see in my video. At Ocean Park Beach, boogie boarders and kite-surfers mingle with San Juan’s hippest teenagers, so the people watching is terrific. The Doubletree’s non-beachfront location needn’t dampen your tanning plans. When you’re ready to go to the beach, just tell the front desk staff. They give you a printed letter that you hand to the beach attendant, who is stationed next to a Doubletree sign. He will set up beach chairs, umbrellas and towels for your family. You can walk to the beach in a jiffy, but it’s way more fun to catch a ride on the hotel’s kid-approved golf cart shuttle. The driver will remind you to buckle your seatbelt and off you go for the minute-long, wind-blown ride. When you’re ready to head back to the hotel, the beach attendant will call the shuttle to whisk you back. All 184 Doubletree rooms are clean and spacious with mini-fridges, microwaves, in-room coffee and tea and free Wi-Fi. There’s a large Super Max market located across the street, so you can purchase breakfast and snack foods and eat them in your room, or at a shady poolside table. The pool/whirlpool area is nicely landscaped and includes table tennis and a giant chess set for added diversion. There is no on-site casino, a real plus for many families. The hotel has several dining options, including a fancy chocolate shop and Starbucks. It’s only a two-minute walk to Condado’s main drag, Avenida Ashford, loaded with dining possibilities. Pinky’s is a casual favorite, thanks to friendly service, very low prices and a cool vibe. Try one of their yummy batidas, refreshing fruit smoothies that they serve in a blender. The fresh salads, grilled sandwiches and wraps are big enough to share. It is very near the Doubletree’s beach set-up, so it’s a convenient lunch spot when you’re enjoying a day at the beach. If you can convince the kids to explore the neighborhood’s cultural offerings, the terrific Museo de Arte de Puerto Rico, with its fine collection of Puerto Rican and Latin American art and fabulous garden filled with native flora, is only a short walk from the hotel. When you are ready to head to Old San Juan, the number 21 and T5 buses stop directly outside of the hotel. Pay your 75¢ (exact change only) and you’ll be in the old city in about 20 minutes. If the kids are tired on the way home, taxis charge a fixed rate of $15. 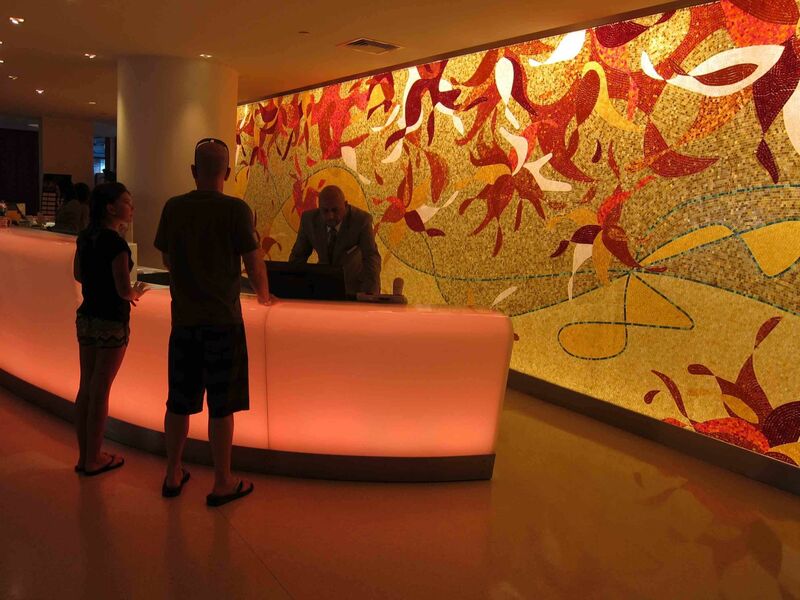 The 571-room Condado Plaza Hilton holds special appeal to families with very young children. 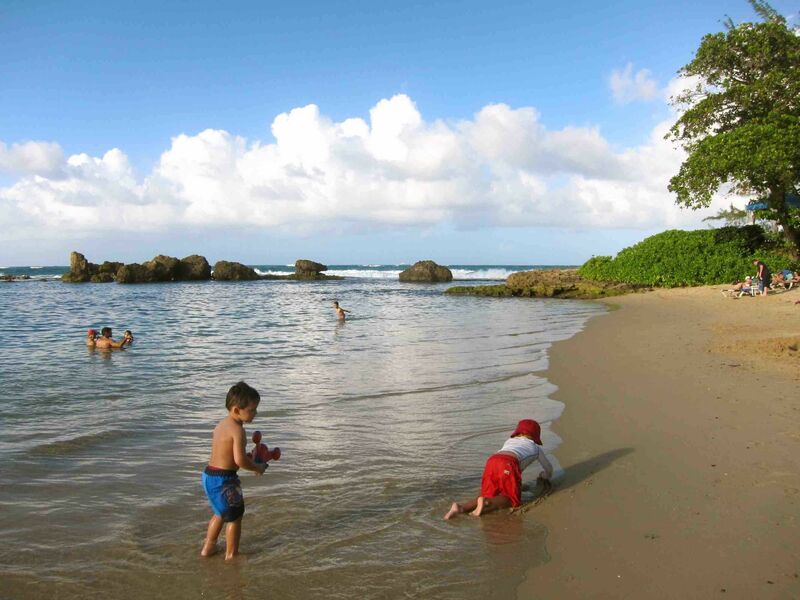 That’s because it’s located on protected Condado Lagoon, with gentle waters that are calm enough for even toddlers to dip right in. Families with older kids can rent kayaks and safely paddle away. The other side of the hotel fronts the sea, so you can see the big waves and dramatic surf but swim in the approachable lagoon water. The hotel’s small public beach attracts lots of neighborhood families so don’t be surprised if your tot romps with tiny bi-lingual locals. Food vendors favor this beach, setting up stands selling zesty grilled chicken kebabs, called pinchos, and fresh coconut drinks, so you can explore the local street food scene without actually leaving the resort. This beach has outdoor gym equipment so you may engage in your daily fitness routine in the sunshine. The main pool at the Condado Plaza Hilton is full of boisterous merriment and waterslides, but there is a quieter saltwater pool that is nice for laps. Young guests will enjoy participating in the “Scout About” program, a family-friendly scavenger hunt inspiring kids to explore the hotel in search of colored wristbands at 10 distinct Points of Discovery. Each time they find a band, they learn a tidbit of information about Puerto Rico. When the game is completed, they receive a coveted trophy wristband. The resort schedules numerous activities throughout the day. Bingo, face painting, and gazing at the mesmerizing colorful fish swimming in the lobby’s large aquarium should occupy the kids when they’re out of the water. Guest rooms are spacious and public areas are decorated in a modern, bold color palette. The Condado Plaza Hilton has a popular casino. On-site dining options are plentiful, from an economical meal at Denny’s to a gourmet culinary experience at Pikayo. 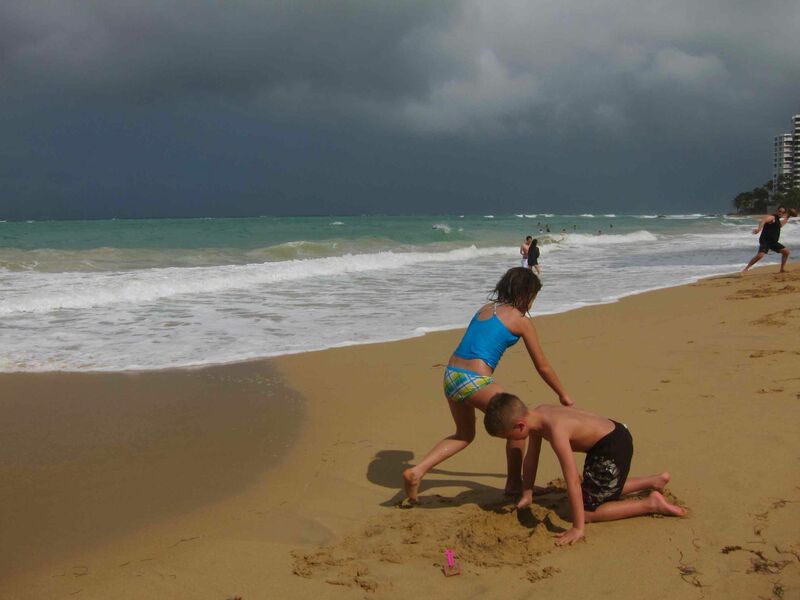 Condado is very close to San Juan’s main airport, so your toes will be in the sand soon after touchdown. But don’t get too comfortable. Puerto Rico’s capital, San Juan, is where you will find the historic colonial city. Be sure to allow at least half a day to stroll this Unesco World Heritage Site’s distinctive blue-hued cobblestone streets and visit its fort, El Morro. For more information on visiting Puerto Rico and to learn about other lodging and dining options in Condado, visit the tourist office site at See Puerto Rico.